Turban knot headband with birdcage veil. 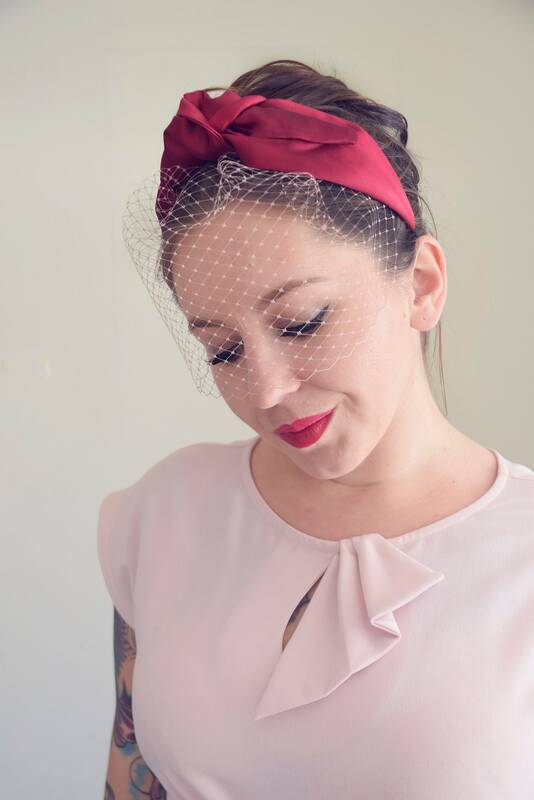 Made with claret red mulberry fabric and vintage pink, soft netting birdcage veil. You can easily take the veil off and wear headband only, 2 in 1! Perfect for everyday use or more formal events, like wedding and cocktail parties. To fulfil your order, you must provide m with certain information (which you authorized Etsy to provide to me), such as your name, email address, postal address, payment information, and the details of the product that you’re ordering. You may also choose to provide me with additional personal information (for a custom order , for example), if you contact me directly. Access. You may have the right to access and receive a copy of the personal information I hold about you by contacting me using the contact information below. Change, restrict, delete. You may also have rights to change, restrict my use of, or delete your personal information. Absent exceptional circumstances (like where I am required to store data for legal reasons) I will generally delete your personal information upon request.Object. You can object to (i) my processing of some of your information based on my legitimate interests and (ii) receiving marketing messages from me after providing your express consent to receive them. In such cases, I will delete your personal information unless I have compelling and legitimate grounds to continue using that information or if it is needed for legal reasons.Complain. If you reside in the EU and wish to raise a concern about my use of your information (and without prejudice to any other rights you may have), you have the right to do so with your local data protection authority.